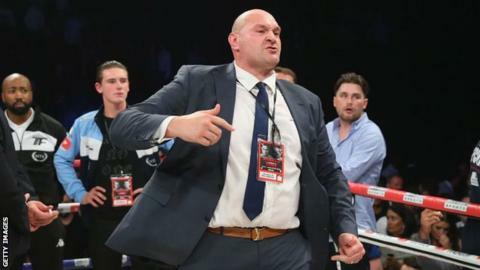 Former world heavyweight champion Tyson Fury says he will be ready to return to the ring in April and expects to have "three big fights" in 2018. The 29-year-old had his licence revoked by the British Boxing Board of Control in October 2016 after allegations of doping emerged in June of that year. Fury, from Manchester, said last week he will not reapply for his licence. But on Thursday, he wrote on social media he would "be ready to fight in April 2018 in a great fight". He added he would return "in the summer in a mega fight" and again at the "back end" of the year. Fury has not fought since November 2015, when he shocked Wladimir Klitschko in Dusseldorf to claim the IBF, WBO and WBA world titles. He pulled out of one rematch scheduled for July 2016 with an ankle injury and a second that was due to take place the following September because he was "medically unfit". Fury said in a 2016 interview with Rolling Stone magazine that he was taking cocaine and struggling with mental health problems. During his absence from the ring he has been stripped of the three belts he won by outpointing Klitschko.